The Fantastic Four have a glorious history in American pop culture. The comic book that debuted the team started it all for Marvel in 1961 and the comic book industry was revolutionized overnight. A lot of years went by before the FF were tapped for a big budget movie and the success of the franchise spawned this movie-theme online slot. Giving the game a try just might be as adventurous as taking part in an epic FF story. The look of the game is clearly inspired from the movie version and not the comic book. The dark blue colors are evocative of the classic Fantastic Four costumes and the various symbols help bring the game to life. The symbols for the game should come as no surprise. The Fantastic Four team members all play a role in the spins. What is really cool about their appearances is the animated features that bring them to life. Mr. Fantastic strengths to great lengths, The Thing performs a feat of strength, The Human Torch turns into a ball of fire and flies away, and The Invisible Woman disappears in a lightening flash. Be on the lookout for the Fantastic Four logo since it is the wild symbol. You get not one, but two scatter symbols: the earth and the herald of Galactus himself, The Silver Surfer. The Silver Surfer awards free games so his presence is definitely going to be appreciated. 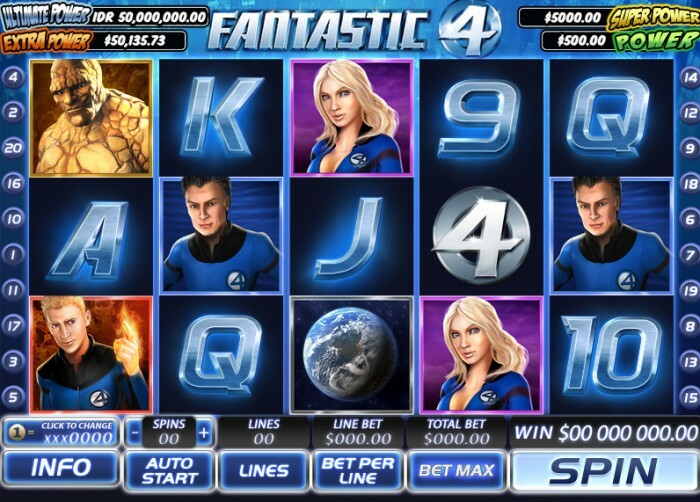 The Fantastic Four slot comes with five reels and 20 paylines. The number of paylines might be less than what is found on other slots, but the payoffs are pretty high. The coin wagers denominations may range from .01 to $5.00 and you could wager upwards of 10 coins on each payline. That opens the door to a possible maximum jackpot of 10,000 coins. For those interested in a potentially huge payoff, this slot is connected to the Marvel Mystery Jackpot, which is connected through the various different Marvel games produced by PlayTech. If the major symbols for this jackpot show up on your spins, you just might end up with a rather generous – if not massive! – payoff. Look for the Earth symbols. When three of them appear scattered on the reels, the free game feature kicks. That means you get 12 free spins and a special benefit on reel 3. Basically, if any of the Fantastic Four characters appear on that reel during the free spins, you get a little something extra. Mr. Fantastic delivers four extra spins and he becomes a wild during those spins. The Invisible Woman means you get a bonus free matching bet along with four more free spins. If the Invisible Woman appears again during these spins, the multiplier gets and increase by one. The Thing provides three free spins. The Human Torch fires up four free spins and Reel 1 gets an expanded and held Torch symbol. The game speed can be adjusted for personal preferences and an autoplay feature is available. Try to program the autoplay feature to a degree you are comfortable with in order to avoid a potential losing streak. The Fantastic Four game just might be one of the most fun Marvel Studios themed games PlayTech has released. Those who love “The World’s Greatest Superheroes” are going to get a kick out of playing this slot.